I’ve been a bit busy (partially working on my charting in R), and so am late with my labour market update — which I had been fretting about, as the Sep employment report was probably the most important release of the past few months. The up-trend in the unemployment rate – which had looked aggressive given the leading indicators – abated in September. On the ABS’s numbers, the headline total unemployment rate fell from 5.3% to 5.2% (or more accurately it moved from rounding up to 5.3% to rounding down to 5.2%). If it stops here, the unemployment rate’s up-trend will be unusual in our recent history: typically if it goes up this far it keeps going up. I seasonally adjust both series myself, to ensure they are comparable, as I am also interested in the spread between the total (-0.05, 5.29%), and matched sample (+0.025, 5.055%) unemployment rates. 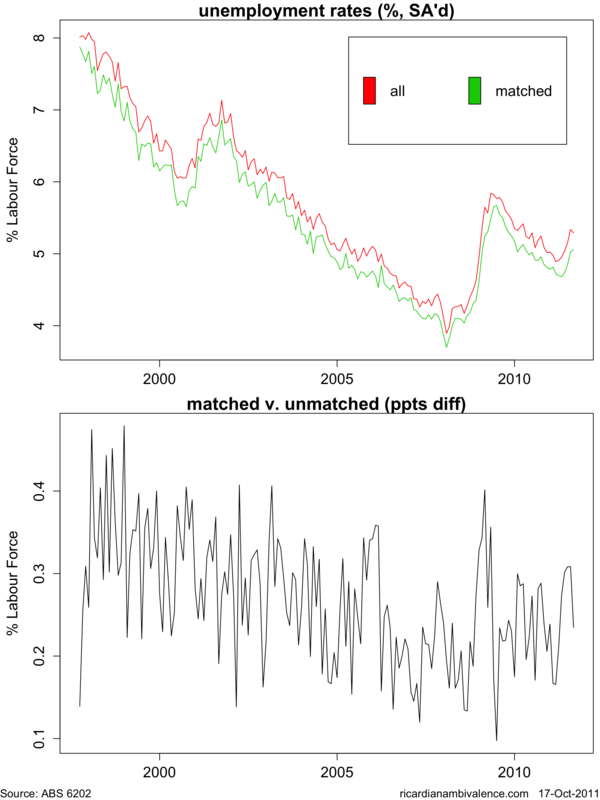 The unemployment rate in the matched sample continued to rise (a bad sign), however the stall in the unmatched sample meant that the spread between the two series narrowed (a good sign). The probability of losing your job, if you have one, rose insignificantly: +0.012ppts to 0.86%. This is down from 0.883% in July, and ~1.05% in March 2009. On the plus side, the probability of finding a job, should you be unemployed, continued its recent up-trend: rising ~1ppts to ~25%. This is up ~5ppts from ~20% in July. There is a potential narrative here about the more volatile ‘unmatched’ being pulled into the newly vacant jobs. That fits the anecdotes about big mining jobs in places like Gladstone (Qld) getting properly started in Q3. This puts the RBA in an awkward position – there is both anecdote and evidence that suggests the bounce they were looking for in Q2 got underway in Q3. If that pickup is sustained, they are not going to have to cut rates – however the are also aware that it’s unusual for the unemployment rate to rise 40bps and stop there … and then there’s Europe. It will be interesting to see their October Minutes tomorrow — to see what they emphasize. Many financial market indicators got much worse between the RBA’s 6 September and 4 October meetings, and if they wanted to, they could emphasize those developments. In doing so, the RBA crafts a neat get-out clause should things continue to improve. This may be desirable. It seems to me that the RBA Board’s October meeting was held at the point of maximum bearishness. Equity indices have since bounced ~10% from their early October lows, and bank Aussie Major Bank CDS has compressed nearly all the September widening. Finally, Australian business and consumer confidence are now around average — which suggests growth around trend. Given this combination of factors, it seems unlikely that the RBA will revise down the right tail of their CPI forecast the 75bps (from 3.25% to 2.5%) that’s required to get a rate cut in Q4 (absent a financial crisis).